Newly popular in this winter's free-agent contracts, the opt-out clause seems to be a player-friendly move, but savvy teams can turn it into an advantage in the future. The opt-out has become an increasingly popular tactic this winter: Of the 15 richest player contracts signed this off-season, eight contain opt-out clauses. That more than doubles the number of contracts with opt-outs, from six in 2015 (including that of Zack Greinke, who opted out after last season) to 13 this season. In fact, more than twice as many opt-outs will come due in the next five years than have done so in the last ten. The perception, meanwhile, is that the opt-out is a player-friendly clause; even commissioner Rob Manfred feels that way, telling FOX Sports' Ken Rosenthal back in December that he was not a fan of the move. "The logic of opt-out clauses for the club escapes me," Manfred [said]. "You make an eight-year agreement with a player. He plays well, and he opts out after three. You either pay the player again or you lose him. "Conversely, if the player performs poorly, he doesn't opt out and gets the benefit of the eight-year agreement. That doesn't strike me as a very good deal. Personally, I don't see the logic of it." It’s certainly true in that the opt-out empowers the player to make the decision, and it's served that purpose repeatedly over the last 10 years. But a closer look suggests that opt-outs offer equal if not greater benefit to the team, provided the team in question can succeed where others have failed in avoiding the temptation to re-sign or extend a player in connection with his opt-out. Let's start by examining the opt-out's usage in the last 10 years. The first instance of a player making the move came in November 2006, when J.D. Drew opted out of the final three years and $33 million of his contract with the Dodgers—one negotiated by his agent, Scott Boras, and former Dodgers general manager Paul DePodesta two years earlier. Ned Colletti, who succeeded DePodesta as the Dodgers’ GM, publicly portrayed Drew’s decision to opt out as a betrayal—suggesting that Drew broke a promise not to do so—as well as a hardship for the team. ​Boras also negotiated the first such opt-out clause, inserting it into Alex Rodriguez’s landmark $252 million deal with the Rangers in December 2000. Rodriguez and Drew both used their opt-outs, as have five of the six players to have such a clause come due since Rodriguez signed his mega-deal. The lone exception was Vernon Wells, who in 2012 wisely chose not to opt out of the final three years and $63 million of the seven-year extension he signed with the Blue Jays six years earlier. By the time his opt-out came due, Wells had sank to replacement level and been traded to the Angels, and his contract had become widely regarded as the worst in baseball. After playing the 2012 season with Los Angeles, Wells was traded to the Yankees in '13 and spent the final year of his deal out of baseball but still drawing a salary of $21 million. As for Rodriguez, his opt-out generated its share of controversy. His decision to opt out of the three years and $81 million remaining on his contract was announced during Game 4 of that year's World Series and followed comments from multiple Yankees officials, including general manager Brian Cashman, that the team would not attempt to re-sign him if he opted out. They were correct in their assessment of the situation but were apparently overruled, as New York signed Rodriguez to a ten-year, $275 million contract that December—one that replaced Wells’s as the worst in baseball. The Yankees were suckered by an opt-out clause again four years later when CC Sabathia used his after the 2011 season to leverage the team into adding one year, an additional vesting option and a guaranteed $30 million to his existing contract. Sabathia, who suffered a quick and dramatic decline after those negotiations, is just now entering that extra year and can trigger his $25 million vesting option simply by avoiding an injury to his pitching shoulder this year. Star players decline more gradually as a group than the population as a whole, but it is nonetheless generally true that players who opt out are in the decline phase of their career. In fact, only two of the 19 players to have an opt-out in their contract from Drew to the present were or will be eligible to do so prior to their age-29 season: Jason Heyward and Masahiro Tanaka, both of whom can opt out after their age-28 seasons. What’s more, the vast majority of multi-year player contracts are either back-loaded (with the player due to earn more money in the latter years of the contract) or flat (with the player due to earn the same salary in every year of the deal). The few multi-year contracts that do see their salaries decrease in the final years do so very gradually. 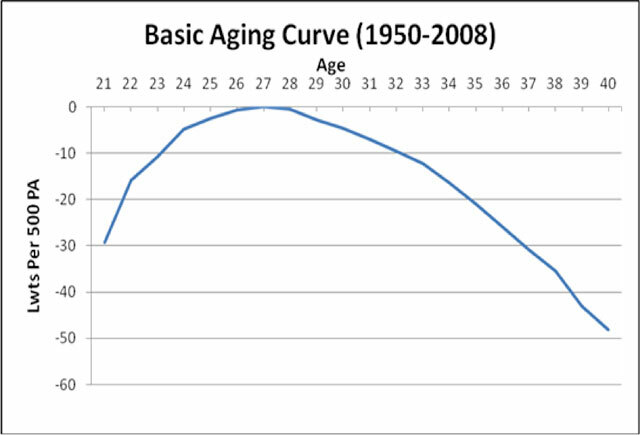 Though the steady inflation in the cost of a win does mean that a $23 million salary five years from now will be relatively cheaper than a $23 million salary today, the sharp downward turn of the aging curve almost guarantees that long-term contracts will be less cost-effective in their latter seasons than their earlier seasons. This is a widely accepted aspect of free agency. When teams sign free agents to long-term deals, they and their fans alike are typically aware that they are likely overpaying for the final seasons covered by the contract in order to secure the more productive seasons in the front half. Opt-outs give teams the hope of not having to pay for those latter seasons, and while it’s true that it is the player who gets to make the decision, some of this year’s contracts suggest that teams are using opt-outs less as a bargaining chip than as a dare. Consider this: According to my calculations (through our "What's He Really Worth" formula, used and explained here), of the 13 players who currently have opt-outs in their contracts, just two project to be worth more in the seasons after their opt-out than they are due to be paid in those years. Those players are Heyward, who will be just 33 in the final season of his eight-year deal with the Cubs, and Yoenis Cespedes, who signed a mere three-year deal with the Mets that would expire after his age-32 season if he were to remain in New York for the duration. Here’s how the math works out for the other 11, ranked by how much their salary in those post-opt-out years exceeds their projected value. player opt-out age years salary value diff. • Kershaw and Tanaka come extremely close to being worth the money after their opt-outs, but given the concerns over Tanaka’s elbow and the workloads that Kershaw is accumulating, as well as the collapse potential of pitchers, neither seems likely to be as good a bet as the numbers above show. • Kennedy’s projected value is negative becuase he was below replacement level over the last three years combined per baseball-reference.com’s Wins Above Replacement; he is projected to return to negative production by 2018 even if he recovers some value with his move to Kansas City. • Stanton’s value is based on a modest projection of 4.3 WAR for the coming season, one that was reached through an unadjusted 5/4/3 weighting of his last three seasons and that reflects his recent fragility and concerns over the condition of his left hand. Boost that to 5.0 WAR and he still projects to be overpaid by $51.4 million over those seven post-opt-out years. Even if you project him to be worth 6.0 WAR—a figure he has only reached once in his career—in each of the next three seasons before beginning a typical decline, his value would come up $5.4 million shy of his salary over those final seven years. • Andrus is listed twice because he has the option to opt out after both the 2018 and '19 seasons. By those numbers, of the 13 players who currently have opt-outs in their contracts, 11 would be doing their team a service by opting out and signing elsewhere. Even if you conceded that it might be worth it for the Dodgers to gamble on Kershaw’s final two seasons provided he’s still healthy come 2018, that’s still 10 of 13 players whose opt-outs are team friendly. Looking back to the six players whose opt-outs have come and gone: Using FanGraphs' Dollars statistic to estimate past value and our What’s He Really Worth formula to project future value, we find a different result. Based on their actual production in the years in question, Drew, Rodriguez and A.J. Burnett all would have earned out the back end of their contracts had they not opted out. Greinke, who opted out of the final three years of his Dodgers contract this off-season, projected to be worth his salary in those final three years as well. The only team-friendly opt-outs from among that bunch were Wells’s and Sabathia’s, though it’s worth noting that Burnett’s subsequent contract with the Yankees looked like a bust before he was traded to Pittsburgh, where the Pirates salvaged his career. Perhaps this is why we are seeing more opt-out clauses. Teams have started to deploy them more strategically, realizing the benefit of luring a high-priced player into opting out of the latter seasons of a multi-year deal. It’s likely not an accident that eight of the 13 players with opt-outs in their contracts are pitchers. Who wouldn’t rather have Kazmir for one year at $16 million than three years at $48 million, or Cueto for two years at $46 million instead of six years at $130 million, or Price on a three-year deal instead of a seven-year deal? We know why players want opt-outs. They want the flexibility, the option to escape a team or city if things go bad and, of course, the chance to re-enter the free-agent market for another big payday (or to leverage their team into an extension) before their decline takes hold. What changed this off-season is that more teams realized that giving a player that option—which, in negotiations, is a concession to the player that can tip the balance in a bidding war or even limit the length and cost of a contract’s overall commitment—can actually be to the team’s benefit. The key is having the resolve to avoid re-signing the player for more if he does opt out. Rodriguez and Sabathia are the obvious cautionary tales, but Greinke may join them; he likely would have been worth the final three years of his Dodgers contract, but his new deal with the Diamondbacks projects to be a significant overpay. By that same measure, the decision to opt out may no longer be automatic on the player’s part. Cespedes seems like a lock to opt out this November; not even a prolonged disabled list stay should keep him from testing next off-season’s market. But the other two eligible players, Kazmir and James Shields—the latter of whom would be leaving two years and $44 million on the table heading into his age-35 season—would be best advised not to use their opt-outs barring anything short of Cy Young contention this season. The same goes for Cueto, Kennedy, Tanaka, and Chen in November 2017. Given that shift in the value and perception of the opt-out, we’re likely to continue to see such clauses included in the game’s richest contracts.